This is my 100th blog post. Last weekend my girlfriends and I planned to go taste as much beer as possible at the Blue Point Brewing Company, and then head north to Port Jeff to eat for cheap at Tara Inn. Blue Point used to boast a free tasting menu which seemed too good to be true, but upon arrival we were told that things had changed. The bartender explained that we could each have three free samples and try the rest of the menu, including about 12 more samples, all for $17. We were each handed two bathroom sized cups full of the lightest two beers on the list, and were asked to recycle the cups until we made it to the darkest beer at the bottom of the list. 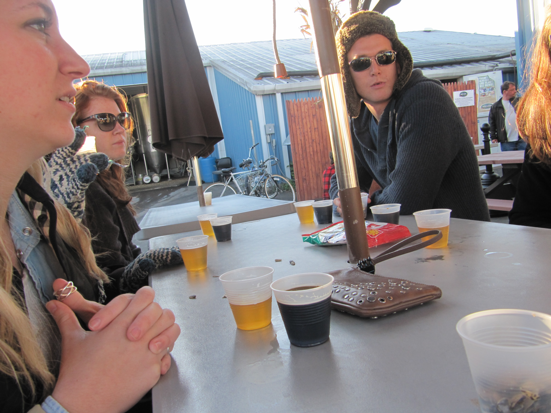 We brought our beers outside to the tables out back and the games began. Do you want to bring your dog to the brewery with you? A pizza or other food? 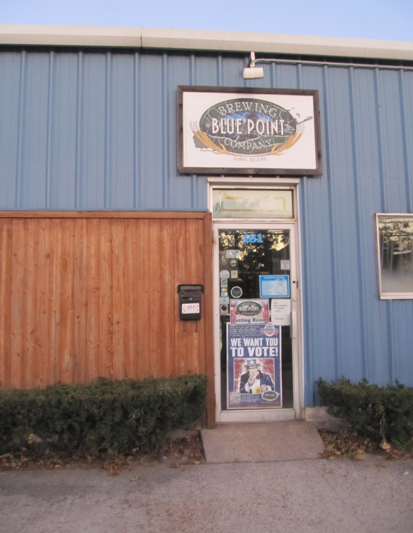 Go for it; Blue Point is a totally relaxed place with nothing but good vibes and great beer. (I vommed after I wrote that sentence.) We started off pretending like we cared what each beer tasted like, or maybe we actually did care, but that game was easy to forget once we got towards the end of the list. We rated some of the samples from 1-5, but all I can remember is that the all of the girls really loved the Blueberry Ale and the guys hated it. I was so excited to finally try the Rastafa-rye and the Hoptical Illusion that I have seen so often on tap in LI and NYC bars, but those two samples were towards the end and have blended into the dark abyss of my memory. I liked the Pale Ale but this hoppy selection got mixed reviews from the rest of us. The only "don't" to mention here: Don't try to get a beer for your friend in addition to your own in one trip to the bar. They insist that each drinker appears for their own beer. We left Blue Point around 6 and headed up to Tara Inn on the outskirts of Port Jeff. This place looks and feels like a biker bar but has super cheap food and a fun atmosphere. It was packed with students from Stonybrook when we got there and although we thought we might have a long wait for food, it came out quite quickly. My bacon cheeseburger was $1.50. 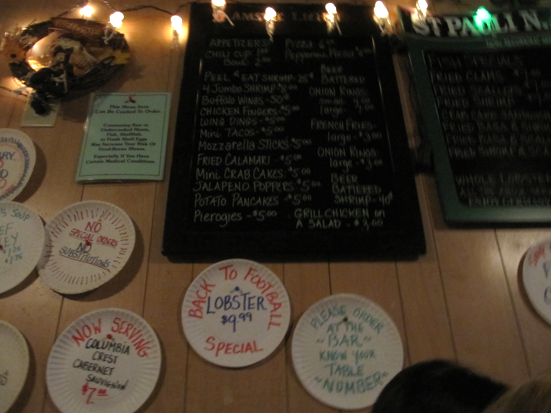 Laura's lobster was $10. That's cheap. Could be the cheapest lobster south of Maine. We splurged impulsively on 10 beer battered shrimp for something like $3, and despite being small they were good and seemed fresh. You have to be on top of your game to push to the bar to order food and to stake out a highly demanded table, but all in all this place is good, cheap fun. Check the paper plates on the walls for some of the best deals. Note to John, a 25 year old super senior student from Stonybrook: I'm actually a nice person. I was rude to you because after 5 minutes of conversation, you were standing so close to me that your midsection was touching my thy. Yes, midsection to thy; you're short. Approximately 15 beer samples and a bacon cheeseburger with fries: $19. 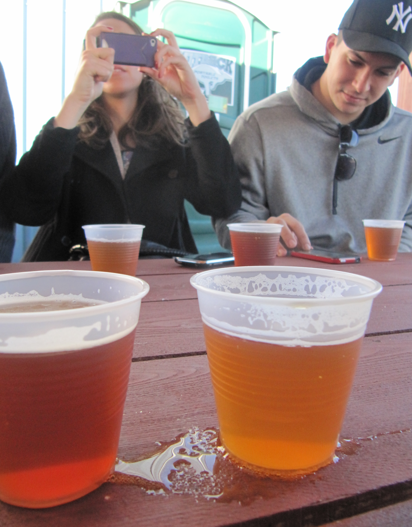 Binge drinking and gluttony disguised by beer-tasting and deal-chasing: priceless. -Tasting Room is open for select hours on Thursdays, Fridays and Saturdays. Juuuust fyi - people who say they are nice really aren't. haha jk. I want to try the $10 lobster wth. Lobster truck outside work sells it for $17. Ridiculous! !